Independence Day is right around the corner, and here are a few ways to bring in the holiday, whether it’s at the beach, at a pool, at a jazz festival or a soul dance party. Check it the #WilsonsGuide Top 10 Independence Day in LA List! The Merriment: Coining itself as downtown’s biggest rooftop fireworks display, the Grand Park Block Party will have multiple stages with live entertainment in the afternoon and fireworks at night. 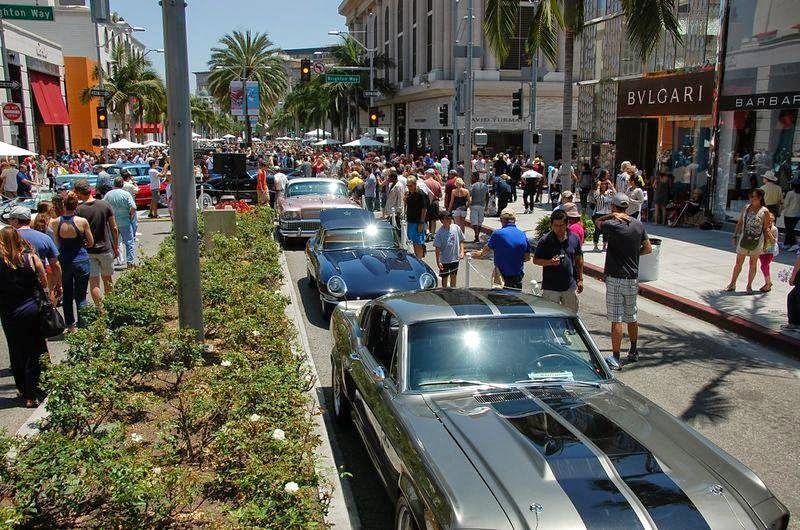 Parking Situation: Options include Pershing Square, FIGat7TH (beginning at 4 p.m., you can get the $5 PARK + PLAY). Additional parking recommendations can be found at PARKME.COM. You can also take the Metro Red and Purple lines to PERSHING SQUARE STATION or the Gold Line to UNION STATION or LITTLE TOKYO/ARTS DISTRICT STATION. The 4-1-1: Venture off to one of downtown’s newest parks for food vendors, live music and of course, fireworks. The ALTimate Main Stage and the SOULNIC Stage will feature musical performances by acts such as Brick + Mortar, Echosmith, DJ ALA, Tailwind Turner and Derrick Wize. Also, several eateries like the Grand Central Market, a #WilsonsGuide pick, are providing discounts before and after the party if you show a valid TAP card, Metro employee ID or LA County employee ID. Check the Grand Park website for more details, which also has an extensive list of what not to bring (including alcohol, water bottles with liquid and large coolers...make sure to read that carefully before going). 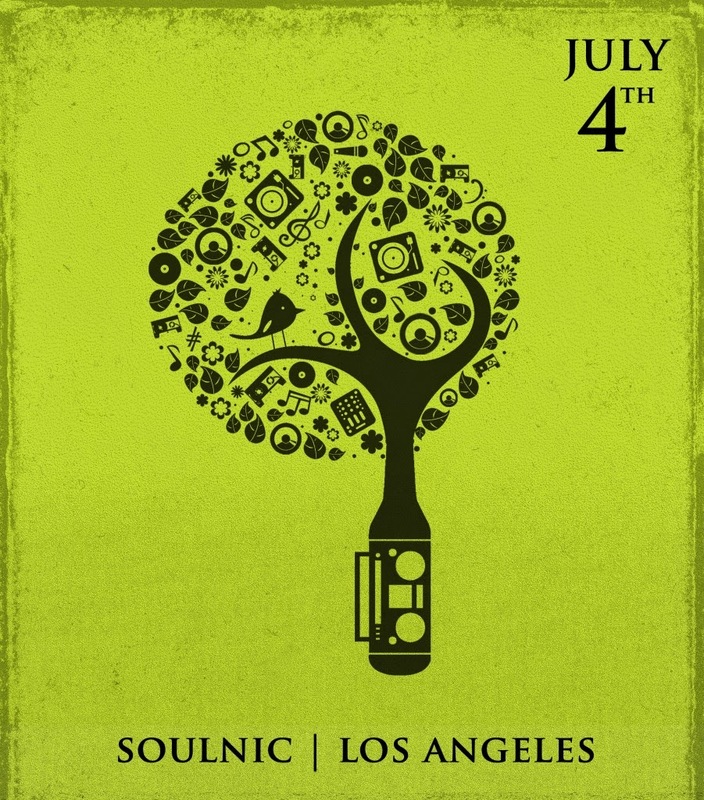 And if you do attend, use the hashtag #GO4THDTLA for all your social media posts. When-To-Go: Friday, July 4, starts at 4 p.m. 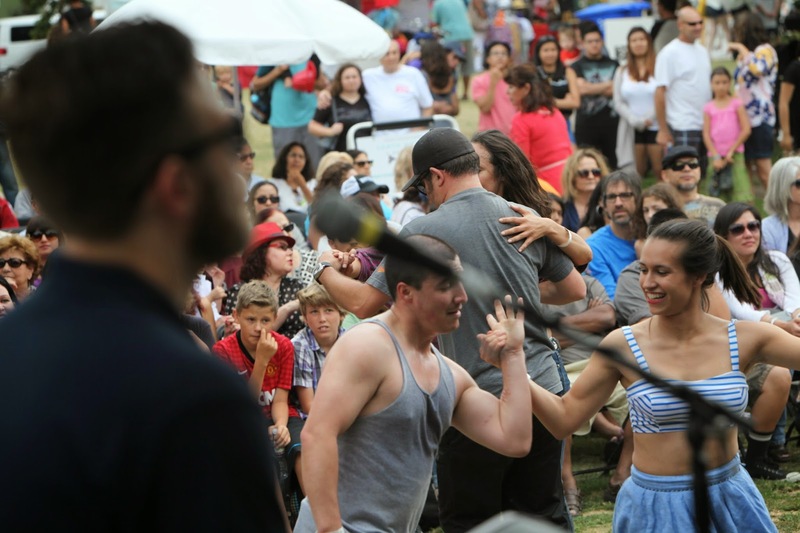 The 4-1-1: SOULNIC is technically part of this year’s Grand Park Block Party, but it’s actually been its own separate event for the past three years, previously held at Griffith Park. With the venue change comes DJ sets by Extra Mild Sauce residents Tailwind Turner, Drack Muse and Derrick Wize, and also from a special guest, DJ ALA. Comedian Deon Cole will be the host. And of course, stick around for the fireworks! The Merriment: Water, sport and kids activities, music and fireworks in the Redondo Beach lagoon. When-To-Go: Friday, July 4, 2 – 9:30 p.m. Parking Situation: Nearby lots, including the Redondo Beach Marina, City Hall/Library lot, the Redondo Beach Pier parking structure and the Pier Plaza parking structure (some ticket packages include parking already). 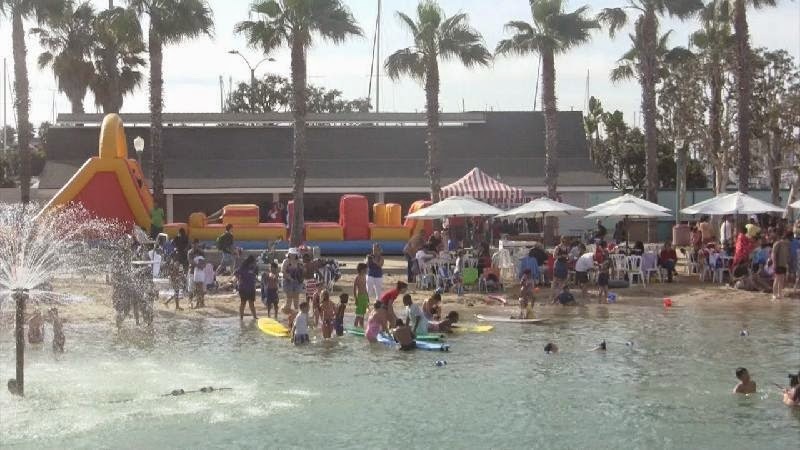 The 4-1-1: Redondo Beach is providing a variety of active, hands-on experiences, including a Big Slide Obstacle course, a Beach Sports Piano Run, free paddleboard experiences and swimming in the lagoon. 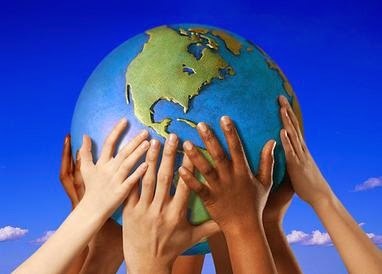 Music will be diverse, with an iPod playing, a DJ, a drum circle where everyone can participate and several performances from live bands. There’s also a lot of activities to keep the kiddies occupied, from traditional arts & crafts to an educational “Sounds Like Science Show” and the eighth annual Kids’ Parade. The night culminates with fireworks over the water; seating is available in tables and on the sand for the show. 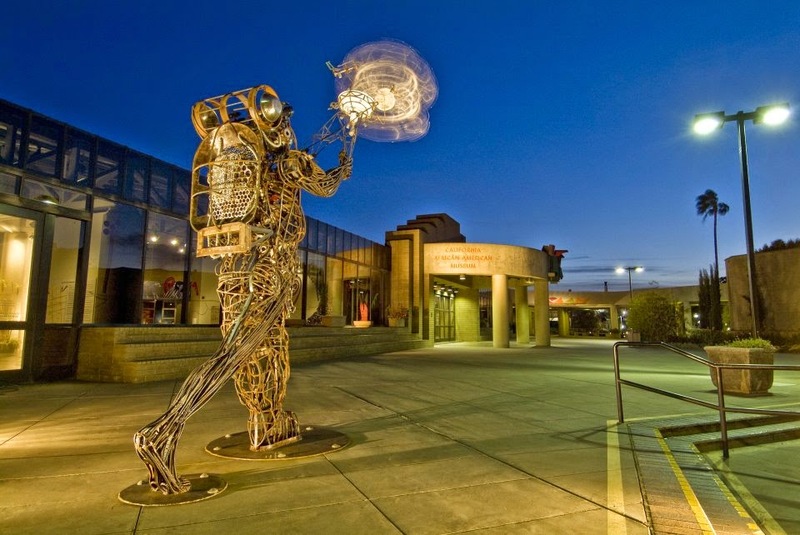 The Merriment: Museum exhibits, a free concert and fireworks at the California African American Museum. 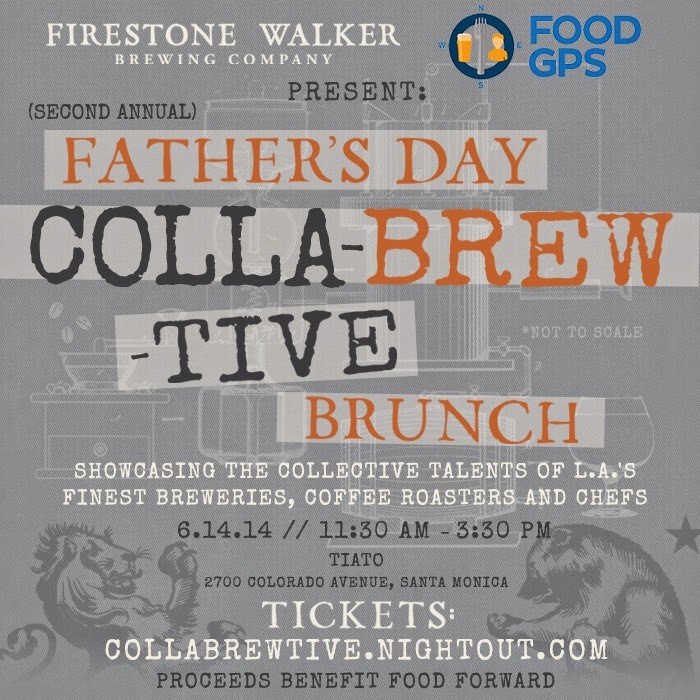 Parking Situation: $10 in the lot adjacent to Fig and 29th. Or, take the Exposition Line and exit EXPO PARK/USC STATION. 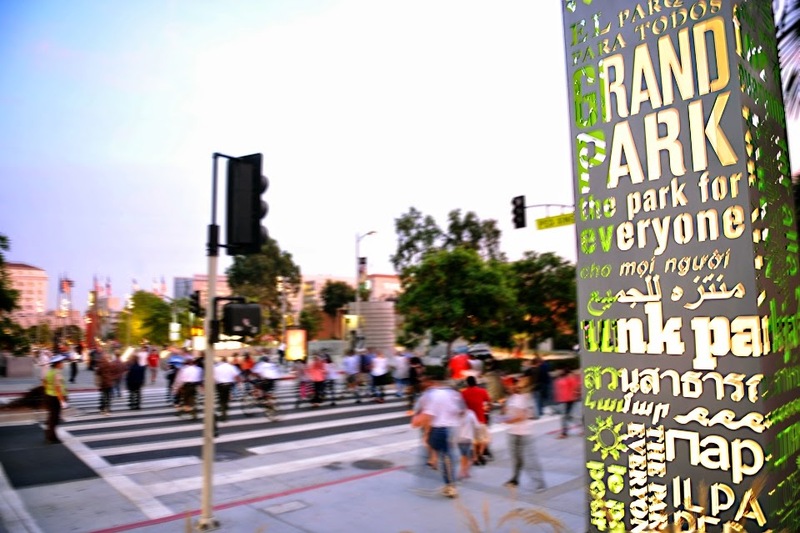 The 4-1-1: One of L.A.’s most prominent museums, CAAM will be open from 11 a.m. until 5 p.m. Currently, there are several exhibitions on display, including: Hands On Design and The March on Washington: A Tribute, 50 Years Later. At 6 p.m., CAAM’s outdoor Plaza Stage will feature a concert, and you can stick around to see the fireworks from Exposition Park that will start at dusk. 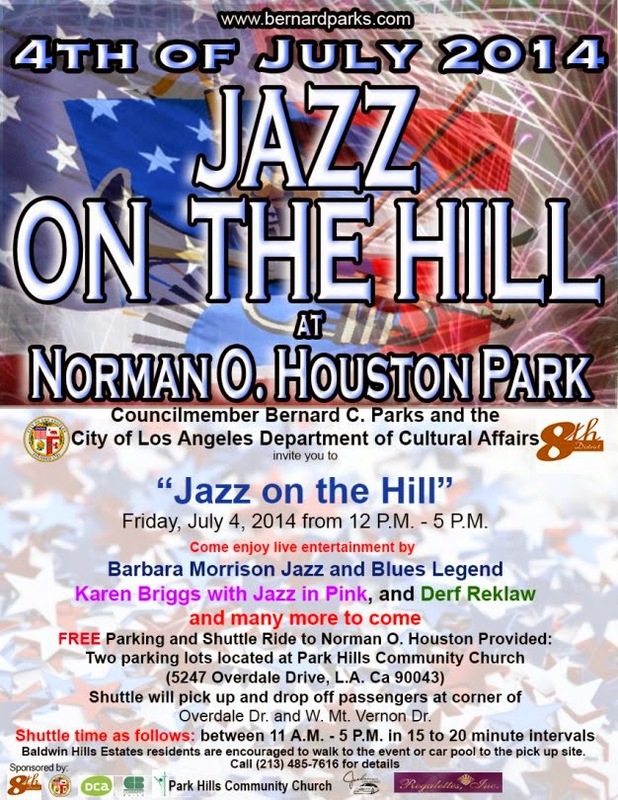 The Merriment: Several prominent jazz musicians will be giving performances throughout the afternoon at this Baldwin Hills park. When-To-Go: Friday, July 4, noon – 5 p.m. Parking Situation: Shuttles will be bringing guests to and from the park in 20 minutes intervals from the free parking lots at the nearby Park Hills Community Church. Or, you can walk from the parking lots to the park; it’s about two blocks away. The 4-1-1: Eighth District Councilmember Bernard C. Parks and the City of Los Angeles Department of Cultural Affairs are hosting this mellow afternoon of live jazz music. Expected to perform are Derf Relaw, Karen Briggs with Jazz in Pink and someone I personally think is quite amazing, Barbara Morrison. As of last week, sewage construction adjacent to the park has been going on for months, so let’s hope it’s finished in time for the event. The Merriment: “Family-friendly Independence Day festivities” featuring food trucks, activities for children and a fireworks show by Pyrospectaculars. When-To-Go: Friday, July 4, noon – 10 p.m. Parking Situation: There are several shuttle parking pick up and drop off locations on W. Slauson Ave., Crenshaw Blvd. and Degnan Blvd. Shuttle service will run every 15 minutes, from noon – midnight. 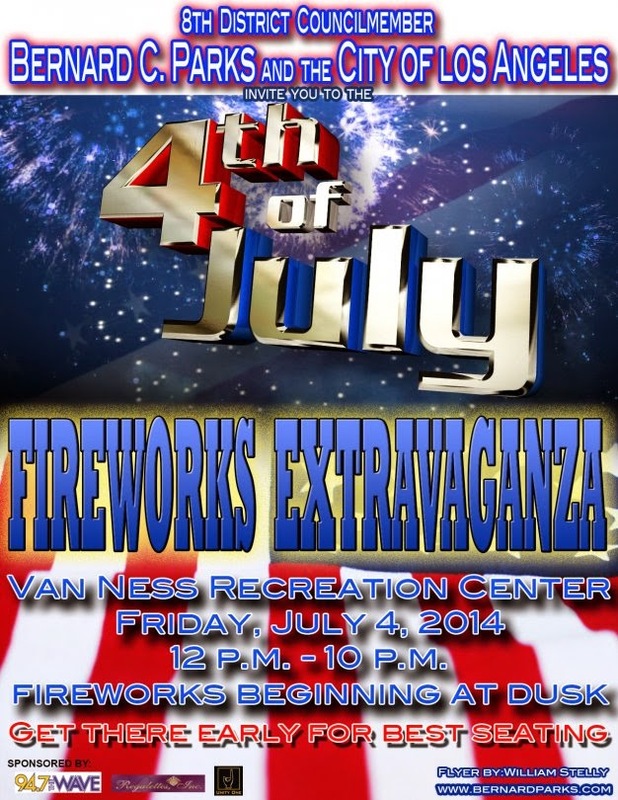 The 4-1-1: Eighth District Councilmember Bernard C. Parks will be rather busy this Independence Day! While he’s hosting a jazz in the park event in the Baldwin Hills area, farther east in L.A., he’s also putting on this Fireworks Extravaganza along with the City of Los Angeles at Van Ness Park. He originally started this event 12 years ago to help prevent illegal firework activity in the city. Event partners include Unity One, Inc., the Regalettes and 94.7 Wave, which will have a DJ synchronize music along to the fireworks show. Fireworks will be produced by the same company producing the fireworks show at the Rose Bowl. This is the first year that Parks’ Fireworks Spectacular will be held at Van Ness Park; the previous 11 years, it’s been at other locations, including the Los Angeles Memorial Coliseum. When-To-Go: Friday, July 4, noon – 8 p.m. Parking Situation: Valet parking is available at the hotel; there’s also limited street parking and a nearby parking structure across the street. 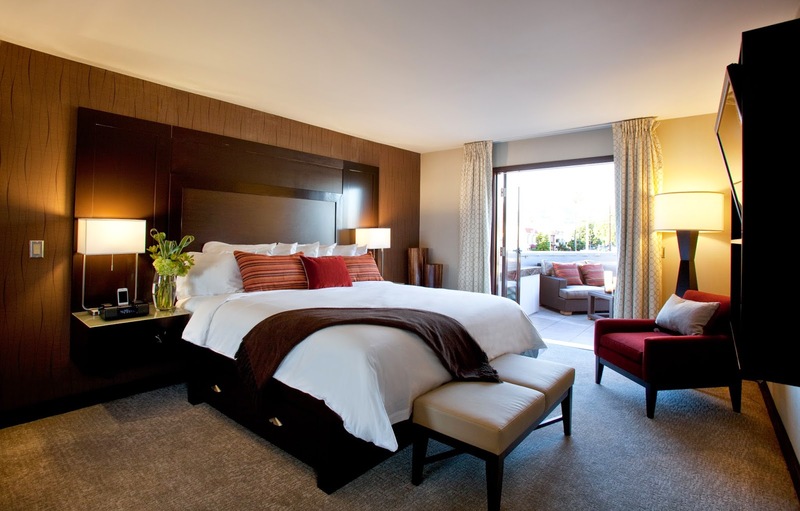 The 4-1-1: If stereotypical 4th of July festivities like BBQs, the beach and fireworks aren’t really your thing, head to a #WilsonsGuide favorite, the Hollywood Roosevelt Hotel for a poolside function featuring rotating DJs throughout the afternoon. 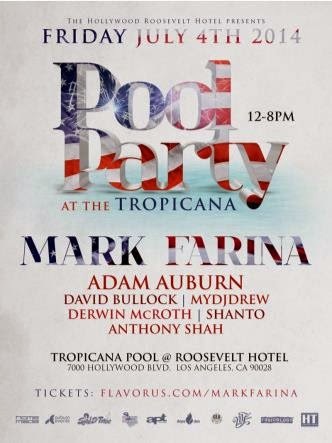 Headlining the party is Mark Farina and there will be other acts, including Anthony Shah, Shanto and David Bullock. The Merriment: An outdoor concert, voter registration and vinyl records "Beat Swap Meet" at the California Plaza. When-To-Go: Saturday, July 5, doors open at 5 p.m., show starts at 7 p.m. Parking Situation: $7.50 cash-only at the Cal Plaza parking structure, beginning 90 minutes prior to the 7 p.m. show time. The 4-1-1: Let the celebrations continue the day after 4th of July with a special appearance of Stones Throw Records Label artists Peanut Butter Wolf, Madlib, DâM-FunK, the Lions and others at the Cal Plaza’s Grand Performances. Arguably one of the most significant labels to come out of L.A., Stones Throw Records has a track record of having represented many industry game changers and trailblazers, including Madlib (a.k.a. Quasimoto), Aloe Blacc and the late J Dilla. This year marks the record label’s 10th anniversary and this special set is part of the 28th annual Grand Performances at Cal Plaza that will run until September. The Merriment: Three days of Independence Day festivities on a U.S. navy warship. Parking Situation: Park at the Port of Los Angeles lot, $2 per hour. 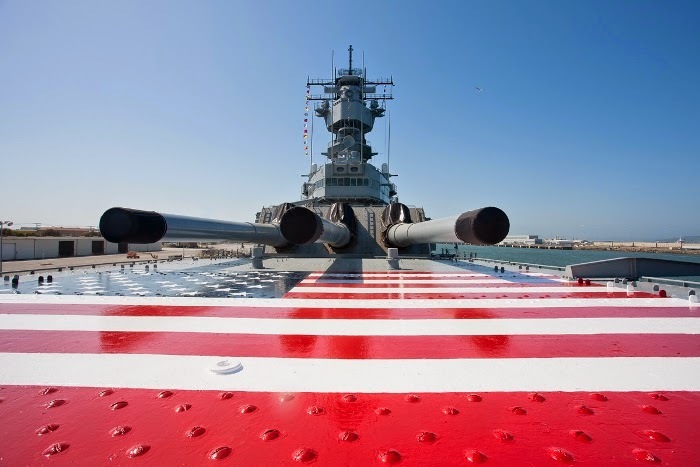 The 4-1-1: Experience what this holiday is really all about by going onboard a massive battleship that’s been involved in three wars—World War II, the Korean War and the Cold War—and is one of only four open museum ships stationed on the West Coast. Take a historic tour to learn about the ship’s legacy of defending the U.S., and also try your luck on the obstacle course. Food and drinks are an additional cost at the All American BBQ and Beer Garden, and there will also be live entertainment. 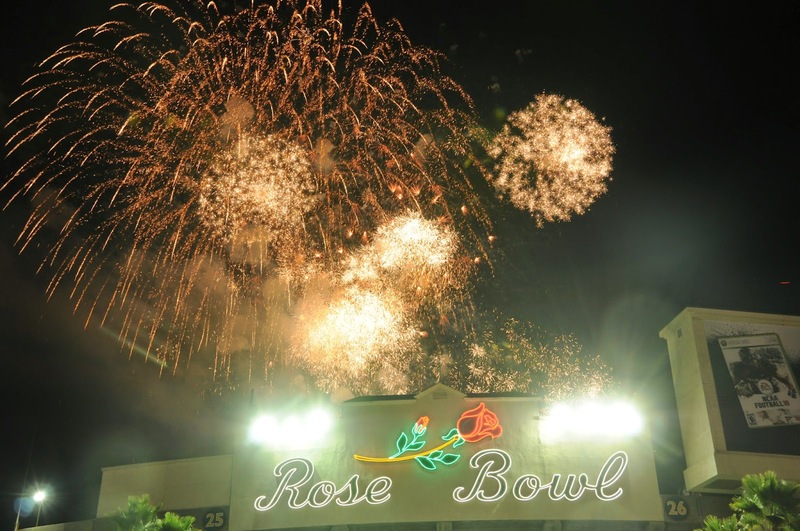 The Merriment: The Rose Bowl’s 88th time celebrating Independence Day. The Vibes: Massive, impressive, grand, outdoors, the ultimate fireworks show of all shows. 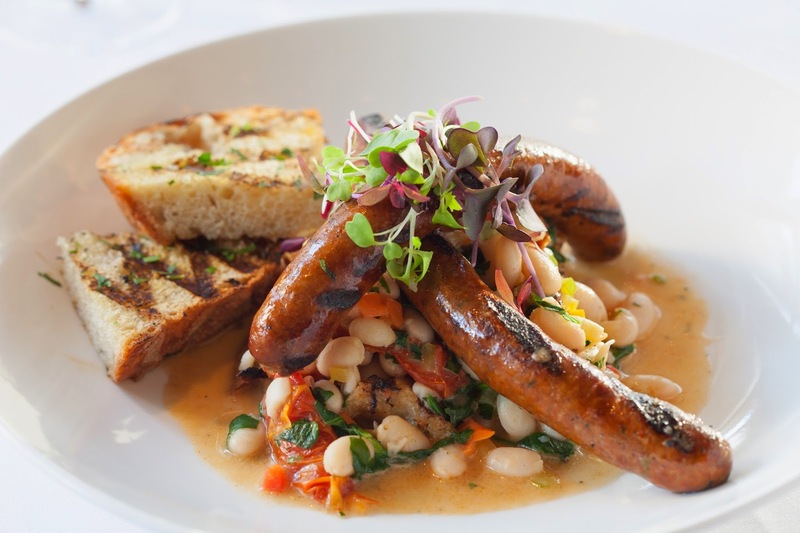 When-To-Go: Friday, July 4, 2 – 9 p.m. The $ Factor: $13 - $25, depending on seating location in the stadium; veterans and up to three of their guests receive complimentary admission. Parking Situation: Parking at the stadium is available in advance for $20 and for $25 on actual event day. The 4-1-1: The Rose Bowl has one of the largest fireworks productions in the L.A. region, produced by Pyro Spectaculars by Souza. Doors technically open at 2 p.m., but most of the action doesn’t start until later, around 7 p.m. That’s when you can expect to see motorcycle stunts and the Liverpool Legends and Ian Thomas take the stage. And, the grand finale, the fireworks show is at 9 p.m. For an additional fee of $8-$10, you can take guided tours of the stadium between 2:30 and 6:30 p.m. The 4-1-1: CHAYA Downtown is part of a larger restaurant group consisting of locations throughout California and Japan. The group is operated by the Tsunoda family, who’s been in the restaurant business for more than 400 years. Parking: Four hours free parking in an underground structure; $7 afterwards. Entrance off Flower St.
I’ll Be Back…: For the Tokyo Mule and the Grilled Sweet Corn! Every summer for the past several years, CHAYA Downtown has converted its outdoor patio into a Summer Beer Garden, with bright, colorful lanterns and strings of glittering lights hanging high in the trees above, a traditional Yakitori grill festively placed in a corner (pictured below) and Japanese-inspired small plates, cocktails and beers available to enjoy. As I had tremendously enjoyed the 2nd Annual Summer Beer Garden, I was thrilled to have the opportunity to return this year. Arriving on CHAYA’s “Beer Garden” patio, I immediately noticed some elements have remained the same: the large pitcher of sangria welcomingly perched on the outdoor bar, two of my favorite items on the menu (more on that later)…yet there were definitely some new aspects to appreciate as well. Take for instance, the Boozy Sno Cones. They're basically a grown-up version of a childhood favorite for many—the snow cone: ice compactly packed into a cone-shaped paper cup with flavored syrup drizzled over on top and soaked into the ice. New for this season of the Beer Garden, these Sno Cones conveniently come in an orange holder (so that you don’t have to hold it all night and your hands won’t get sticky) and a small wooden spoon (so you don’t have to lick the ice like you’re a 10-year-old kid either, unless, of course, you want to). Choose mango, sweet ginger, cherry or calpico yogurt as flavors. Also, there are now five special cocktails created in honor of five countries (the U.S., Mexico, Spain, Brazil and Argentina) playing in the 2014 FIFA World Cup. Made exclusively with the Brazilian açaí liqueur VeeV, they will be available until the series ends, on Sunday, July 13. More new cocktails include: the Two Tone Melon “Nama,” made with Kirin beer and melon liqueur featuring two layers of different colors for an aesthetically pleasing beverage; the Bloody Maru, with bloody mary mix and soju; the Perfect Hibiki Manhattan, made with a special 12-year-old whisky and bourbon-rhubarb bitters; and my new favorite, the Tokyo Mule, a creative twist on the traditional Moscow Mule, made with two different sakes, fresh blackberries and a housemade sweet ‘n’ sour (pictured below). 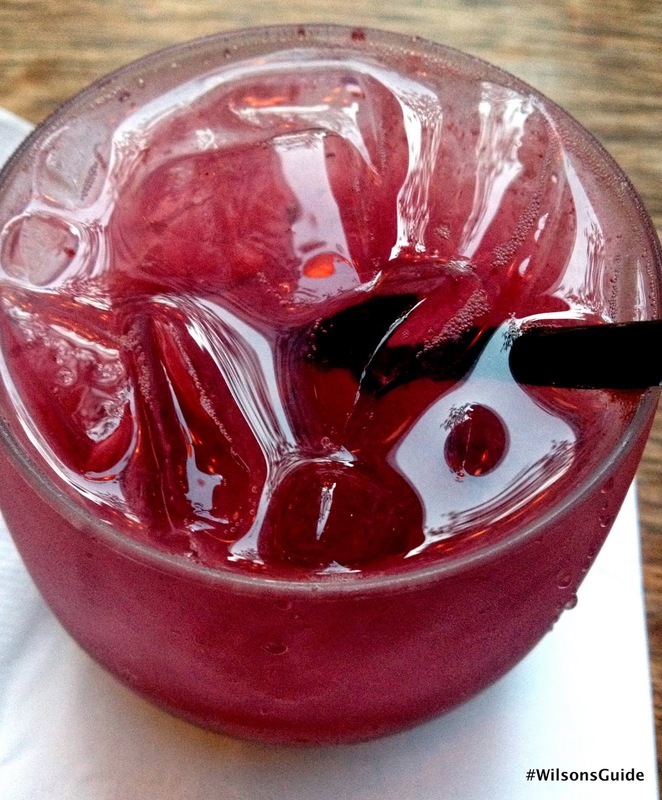 While bursting with rich, fruity flavors, it's still very light and refreshing, making it a fantastic seasonal beverage. As for food, CHAYA has added quite a few new, inventive dishes as well, with a strong emphasis on seafood. The restaurant recently introduced its Kaisen menu, consisting of seafood from local areas and also flown in from Japan. Although the Kaisen menu is technically only part of CHAYA’s dinner menu, its Oysters hailing from Baja California are available on the Summer Beer Garden menu. Served chilled, they are large and crisp, with faint hints of saltwater and a lingering sweetness. For $1 each, they're a great steal. Additional seafood dishes on the Summer Beer Garden menu are the Fish Tacos, topped with creamy guacamole, crunchy lettuce and served with a flavorful salsa, and the Baked Oyster “Sriracha Dote-yaki,” with warm oysters and scallops covered in a tangy, brown sauce, pictured below. Another new, intriguing item that caught my attention is the Soy Glazed Chicken Tsukune. A neatly contained poached egg sits on top a round mound of chicken (similar to a chicken patty, but 1,000 times better!). Yet even with all of the new additions to the menu, fortunately, several staples have returned. This includes the main feature on the menu, the Kushiyaki: skewered or grilled food items that come directly from the Yakitori grill. There are five skewers to choose from and you can pick one, mix and match a few, or select all (which I recommend). They include my favorite—sweetly delicious bacon-wrapped dates—and also chicken covered in a creamy orange sauce, beef tongue, beef and glazed mushrooms. Another one of my absolute favorites, the Grilled Sweet Corn, has also returned! It’s CHAYA’s version of the popular Mexican Elote dish, with feta cheese, a creamy jalapeno aioli and intense spices served on top of crunchy, sweet corn that’s still attached to its husk. It’s great to see the Summer Beer Garden going strong in its fourth year, and it’s most certainly a pleasure to see how many new and returning items there are to choose from. So the next time you’re in the mood to leisurely dine on a shaded patio, with a great selection of Japanese-inspired cocktails and small plates, I recommend heading over to the Summer Beer Garden. But don’t wait too long; it’s only here for a few more months.